Belize and Guatemala are moving ahead with a second round of confidence building measures, but a major wrench was thrown into the works this weekend when Belizean law enforcement killed a Guatemalan civilian. It happened on Saturday in the Chiquibul Forest Reserve, a reported 3.4 kilometers or 2 miles within Belize. According to police, on Saturday afternoon, the BDF were leading a joint patrol along with Forestry officers and police. They were 4 miles north of Rio Blanco and some 2 miles within Belizean territory when they saw a group of armed Guatemalan civilians. The police ordered them to stop, but they report that the men opened fire at the law enforcement personnel who returned fire, fatally injuring 26 year old Tomas Desdicho Ramirez, a resident of the Guatemalan village of San Marcos, in Peten, Police say the other men ran off and the Belizean lawmen recovered a 12 gauge pump action shotgun from the deceased and 6 ounces of marijuana. They also recovered one live 12 gauge and 5 expended cartridges. Again, based on that physical evidence it would suggest outlaw behaviour and provocation of Belize's armed forces - which is consistent with recent history. But, try telling that to a roomful of Guatemalan technocrats in Guatemala City. Well, that's just what the CEO in the Ministry of National Security George Lovell had to do. Lovell was heading to Guatemala on Saturday afternoon for a joint commission meeting between the two countries when he got the news. He arrived in Guatemala City that night to a cocktail reception already in progress. That's where he delivered the bad news. Other members of the Belize delegation of 12 high level technocrats tell us that there was immediate tension. But, thanks mostly to the face to face setting, that dissipated and both sides agreed to postpone the joint commission meeting and work on a joint position statement for the Guatemalan press. That morphed into a joint statement from the both governments - with inputs from both heads of government - which is a first. Those who follow the news know that since 2011 there have been four Guatemalan civillians killed by the BDF and at least three others shot. All events are confirmed to have happened in Belizean territory, and all have created serious and prolonged diplomatic tension. But not this one. Instead this morning, we got a joint statement saying both Governments deeply regret the death, quote, "that occurred in the Chiquibul Reserve, Belize." It adds that quote, "The Prime Minister of Belize and the President of Guatemala have been in telephone contact on the regrettable incident. The Prime Minister assured the President that his government will investigate the facts relating to the incident, and should it be found that there is culpability by persons involved they will be brought to justice in accordance with the law." End quote. The statement then goes on to say, quote, "Both leaders committed to making extra efforts to coordinate actions in order to avoid incidents of this type in the future which may lead to fatalities." End quote. Guatemalan authorities and the OAS will witness the autopsy and visit the crime scene. The statement concludes, "The Prime Minister of Belize and the President of Guatemala reiterated their commitment to the maintenance of peace and the promotion of friendly relations between both peoples and rejected any form of use of force to resolve any differences between the two countries." That is pretty strong stuff for an unprecedented joint statement, and in that spirit the joint commission meeting which was to have been held on Sunday in Guatemala City has been re-scheduled. On Monday, we told you about the armed encounter on the border where Belizean Armed Forces killed a Guatemalan civilian. They said that he shot at them first, and that there were signs that these civilians were engaging in illegal activities in Belizean territory. Well tonight, we'll show you photographic evidence which supports their story. We've also been able to gather a bit more details as to how the incident unfolded. Approximately at around 4 o'clock Saturday afternoon, a joint team of officers from BDF and Police were on operation with FCD rangers. 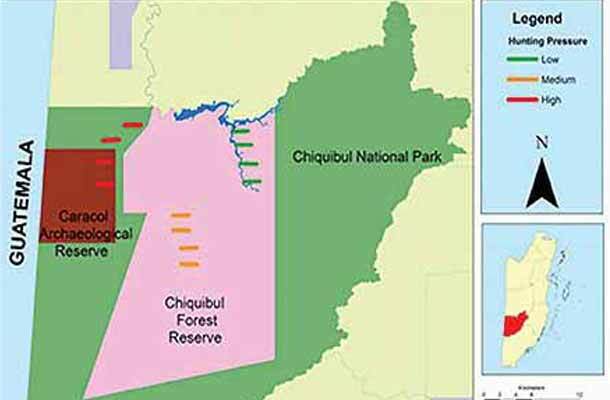 They were 4 miles from Rio Blanco and 2 miles within Belizean Territory, patrolling the area, when they discovered this clearing in the Chiquibul National Park. It's a forest reserve so naturally, the patrol investigated why the trees were cut down. That's when they found 2 huts, which suggested that human activity taking place in the area. They also found discarded food, and further investigation of the area led them to find 40-50 marijuana plants, and a garbage bag containing unplanted marijuana seeds. These discoveries led the Belizean lawmen to believe that the area was cleared for marijuana cultivation, and that the huts and the food belonging the farmers who were trying to harvest these drugs. The joint team then assembled themselves into 3 groups, a rear, a right and a left protection group, and they continued to investigate. They then saw 2 armed civilians, which was approaching the right protection group. The lawmen identified themselves to the 2 civilians, ordered them to stop and place their weapons on the ground. That's when the men took aim and fired at the joint team, who say that their lives were sufficiently threatened by the very hostile behavior. At their commander's orders, 3 BDF soldiers opened fire in response. They shot one of the men, later identified as Guatemalan Tomas Desdicho Ramirez, and when Ramirez went down, the other man fled and continued to fire at the officers until he escaped. The team immediately went over to check on Ramirez, who they found already dead, with his 12-gauge shotgun still in his hand where he fell. A search of the area led to the discovery of one live 12 gauge and 5 expended cartridges. The Officers radioed in the incident to Camp Belizario in the Cayo District, and destroyed the marijuana plants. They then transported Ramirez to the Pick-up point, and then to the San Ignacio Community Hospital, where he was pronounced dead on arrival. All officers on the patrol were then confined to Camp Belizario, where they were each asked to prepare separate reports on the conflict, all of which have so far established these facts as the sequence of events. As we've reported, the OAS has been called in as an objective party in the investigation into this shooting at the border, and Guatemalan officials will be present for Ramirez's autopsy and to visit the crime scene of where the shooting took place. In a joint statement from both the Guatemalan and Belizean Governments, Prime Minister Dean Barrow assures Guatemalan President Otto Perez Molina that, quote, "his government will investigate the facts relating to the incident, and should it be found that there is culpability by persons involved they will be brought to justice in accordance with the law." End quote. But with such strong evidence, it is tough suggest that the officers on this patrol who shot Ramirez to death acted inappropriately when they stumbled onto the marijuana plantation being tended to by both Guatemalan men. Meanwhile, the press in Guatemala has been busy denouncing the shooting death of Tomas Ramirez, suggesting to Guatemalan readers that the Belizean lawmen inappropriately used deadly force against him and demanding ballistics testing. We'll keep following the results of the official investigation into this matter. Minister of Foreign Affairs, Wilfred Elrington, met this afternoon with Guatemalan authorities to update them on the investigation into the death of 26 year old Tomas Desdicho Ramirez, the Guatemalan civilian who was killed by the BDF inside the Chiquibul on Belizean soil. "These were two members of the "fiscales" they called them, these are people who worked in the prosecutor's office like the DPP office and they really wanted to come over to see to what extend they could be of assistance to us they told me in terms of trying to get to the bottom of what really transpired out there in the jungle which led to the death of the Guatemalan citizen. It's a difficult circumstances, but this exercise in no different from when it is allege that a policeman here has shot and kill a Belizean. It's the same process they go through; you investigate it in an objective and dispassionate way without it being said that you are sacrificing the policeman. This is a situation that it's almost a situation that damn if you and you damn if you don't because in the case where a policeman is allege to have shot a Belizean and kill a Belizean - if you don't investigate it properly or the public doesn't perceive that you are doing that - the government and the police is criticized." "It's a delicate situation. You have to bear in mind that both the deceased person and the police officer have rights and the balance is to make sure that you observed those rights. They must be accorded all their rights while you have to do your obligation to investigate the matter. Incidents of these nature particularly between Belize and Guatemala is one that always catches international attention because it has the potential to escalate out of proportion, so we have got to be very circumspect in what we do to make sure that in fact we cannot be accused of covering up wrongs that are being done to citizens of Guatemala or any other country." "How do you work towards building back that relationship when a situation like this has happen and there will be that natural distrust?" "Well that's why we are trying to make it as open and as transparent as possible and it is for that reason that we are trying to get a third party to come in and help us investigate, so that it can be seen that we are very open and transparent and not seeking to concede anything. It is very important in my view and in our government's view that we are being open and transparent. We are requested of our allies, the Americans, to see to what extent they could help us." Police are still gathering all the details, and they will have the file fully compiled by next week. A part of that file will undoubtedly be the gun found on Ramirez's body, the shotgun cartridges found nearby, the marijuana plants he was suspected of cultivating, and the marijuana seeds found at their makeshift thatch roof camp.